Margaret K. McElderry Books, 9781481420709, 384pp. “An X-Files worthy mystery keeps the pages turning,” (Kirkus Reviews, starred review) as Parker and his sister do whatever it takes to find their father in this cosmic adventure packed with action from the author of The Ability and Mindscape. When Parker, his dad, and sister Emma move to New York three years after his mother’s death, Parker is having a hard time. He misses London and his friends, his father is distracted with his new job, and Emma is looking out for him instead of the other way around. And then Parker’s dad, on the cusp of a technological breakthrough, is kidnapped. Thanks to a message his dad sent telepathically before the signal cut off, Parker is suddenly on a rescue mission. Now Parker and Emma, along with their friend Michael and Polly the pig, must confront the only link to their father—a dangerous man locked away in an asylum. But all the signs point to one thing: the company his dad works for is up to something big. Huge. A perfectly sinister project that threatens far more than Parker’s family. A project called SIX. 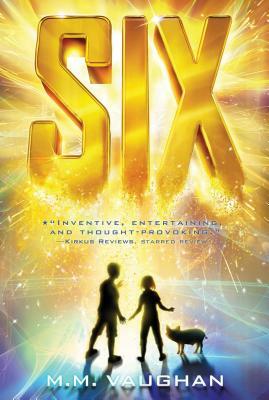 STARRED REVIEW: "Three kids, a pet pig and a helpful chauffeur must unravel a mystery of cosmic proportions. Creative details, likable characters and an X-Files-worthy mystery keep the pages turning, but it is the supportive and loving Banks family that makes this story shine. A surprise ending will encourage readers to think beyond the text and grapple with some real-world dilemmas. Inventive, entertaining and thought-provoking." "Vaughan (The Ability) puts an intriguing spin on the classic SF conceits of teleportation and telepathy, providing a plausible way for these young heroes to face off against an all-powerful corporation. The open-ended conclusion leaves room for further exploration of a concept that is full of potential, and Vaughan’s considered portrayal of 10-year-old Emma, who doesn’t let her deafness slow her down in the least, is particularly well done." "Readers will be drawn into the story with its swift, adventurous plot."